Two great games played back to back! It was an interesting idea to pair up Match Game with Hollywood Squares. While most of the ideas worked, some didn't. Match Game was played first. There were no regulars in this version, except Jon Bauman. Many Match Game regulars from the 70s occasionally played the game, but most of the stars were from current NBC shows. Gene was still in good form and in terms of the format, very little changed. However, without a regular panel, the show was very uneven in terms of gameplay. 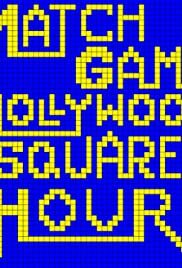 After Match Game, Hollywood Squares was played, with a clever transition from one show to another. 3 additional celebs were brought onstage, and the Match Game panel remained. Jon Bauman, of Sha Na Na, was an odd choice for host. Jon struggled to keep the game moving, as the stars sometimes got out of control, and he was like a substitute teacher desperately trying to get attention. Unlike Match Game, there were no regulars from the original Hollywood Squares. Overall, a good effort, but it could've been better.